For introductory courses in engineering at the freshmen and sophomore level at both community colleges and universities. An environmental engineering text for beginning students. 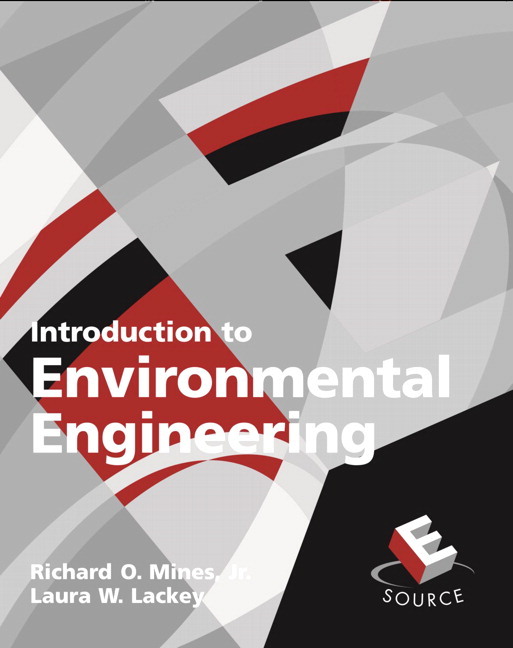 In Introduction to Environmental Engineering, First Edition, authors Richard Mines and Laura Lackey explain complicated environmental systems in easy-to-understand terms, providing numerous examples to reinforce the concepts presented in each chapter. A straight-forward, easy-to-understand approach — This highly-readable text is designed specifically with beginning engineering students in mind. It is appropriate for second semester freshmen who have completed one semester in general chemistry and calculus I, particularly those pursuing a non-technical initiative. An understanding of high-level applied sciences or mathematics is not assumed. A comprehensive introductory text appropriate for today’s students — This text introduces chemistry and biology topics critical to environmental engineering applications and provides a foundation in mass and energy transfer. Subsequent chapters introduce traditional environmental engineering topic areas including water, wastewater, air pollution and control, and solid waste management. A variety of examples, with a practical application to which students can easily relate, are presented throughout the text to facilitate understanding of difficult material. An emphasis on environmental issues includes coverage of global warming, the failing infrastructure within the United States, risk assessment, and hazardous waste remediation. Modular Format — Each chapter is designed to stand alone offering instructors flexibility in how they design their course. Theoretical and practical — The theoretical aspect begins with the introduction of the mathematics, chemistry, and biology involved in environmental engineering applications; the practical aspect relates the theory to real-world applications. Structured solutions for all example problems present the problems in a clear, step-by-step format. English and SI Units — To familiarize students with units typically used in practice, example problems are worked using both English and SI units. Abundant tables, charts, illustrations, and photographs break up passages of text and offer a visual representation of key concepts. Learning objectives and key words, included in each chapter, set the stage for learning and help draw students’ attention to key concepts and terms. Part of Prentice Hall's ESource Series — Esource is an online book-building system that enables you to choose individual chapters from published books in the Prentice Hall ESource Series. The content includes topics in engineering problem-solving and design, graphics, and computer applications. Using this program, you can create a unique text for your introduction to engineering course that exactly matches your content requirements and teaching approach. Visit the ESource site for more information.